Toys ‘R’ Us may have surprised shoppers when it declared bankruptcy, but market experts say it was a long time coming. According to economists, the retail giant’s financial woes were an inevitable result of a changing market in which children’s interest in toys has been almost entirely replaced by a desperate craving for outdated road atlases. No doubt about it, children’s insatiable desire for old highway maps was pretty much a death sentence for a store that mostly sells toys. While traditional toys were once universally popular among children, over the years their interest in products like dolls and action figures has declined and has been replaced with a monomaniacal obsession with obtaining road maps that are so old that they’ve become slightly inaccurate. Instead of being asked for Legos, parents are now routinely begged for items like the 2004 Rand McNally North American road atlas or the 1986 Michelin map of trucking routes in the former Yugoslavia. Despite children’s clear preference for faded maps detailing the weight restrictions of bridges, Toys ‘R’ Us refused to evolve with the times and stuck to the obsolete strategy of selling toys and video games. Now the company has paid the price for stubbornly refusing to adequately stock up on the outdated road atlases that children are losing their minds over. Look at the shelves of any Toys ‘R’ Us and you’ll see evidence of this misguided toy-focused business plan. There are shelves of unsold Minecraft figurines and plastic Star Wars lightsabers, with no sign of the 2011 New England road maps children crave. Even as its debts continued to mount, Toys ‘R’ Us doubled down on toys, and foolishly stocked its inventory with unpopular merchandise like Huffy bicycles and Nintendo Switch consoles. On the rare occasion when you even spot a child in a Toys ‘R’ Us, they’ll inevitably be screaming that they instead want to visit a place with obsolete road atlases, like a used bookstore or the public library. Last Black Friday, four parents were trampled to death in a Barnes & Noble as hundreds of people stampeded into the store’s reference section to get their kids a copy of the 1995 Arizona Department of Transportation surveyor’s map, yet Toy ‘R’ Us stubbornly refused to stock its shelves with a single copy. Frankly, it’s amazing the store didn’t go bankrupt sooner! 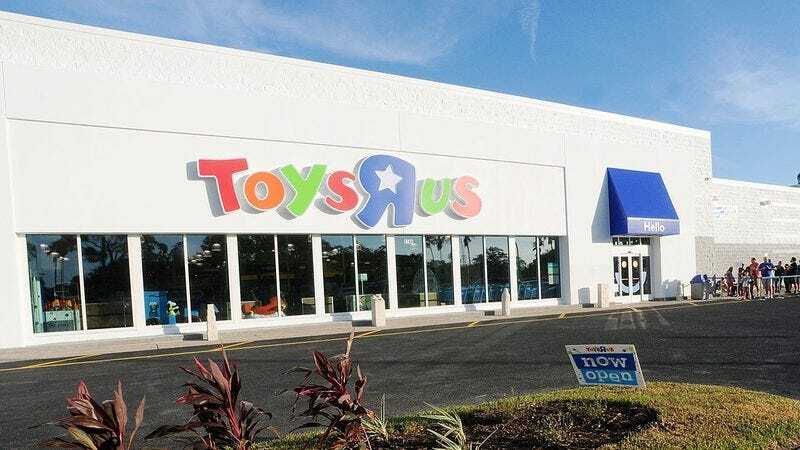 Investors now hope that Chapter 11 restructuring will give Toys ‘R’ Us a chance to pivot away from toys to sell the aging road maps children want. In order for Toys ‘R’ Us to stay in business, it’ll have to realize that toys are the past and ancient, incorrect road atlases are the future.